If you thought the unhealthiest aspects of fast food were things like calorie-stuffed burgers or high fructose corn syrup-laden breakfast sandwiches, think again. 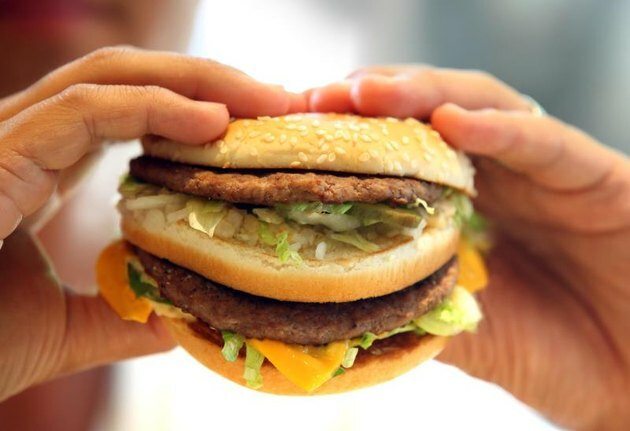 According to a new study, traces of banned, toxic chemicals proven to cause cancer have been found on an alarming number of fast-food wrappers. 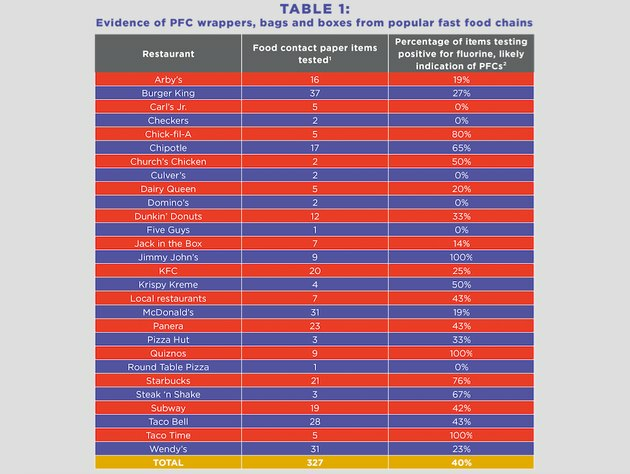 The study, conducted by the Environmental Working Group (EWG), tested 327 food-packaging items ranging from sandwich and pastry wrappers to French fry bags, pizza boxes and other paper and paperboard products from more than 27 different fast-food chains. Its findings showed a staggering 40 percent of the food packaging contained traces of fluorine coatings. The presence of fluorine is troubling because it’s a likely indicator of perfluorinated chemicals, or PFCs. The EWG explains that some PFCs, chemicals that were formerly used to make Teflon and 3M’s Scotchguard, have already been banned. In fact, according to the FDA, fast-food companies had already promised to phase them out when the FDA first discovered they were highly toxic and carcinogenic in even the smallest doses back in 2011. These fluorine-based coatings are used to repel grease and can leach into your food, migrating through the heat and grease. Even worse? According to David Andrews, Ph.D., EWG senior scientist, the use of these coatings is unnecessary because there are plenty of PFC-free food wrappers readily available. While some of these chemicals have been banned, the industry has raced to replace their use with a new generation of PFCs that were also found in the testing of the wrappers. But these new versions’ safety to humans is still largely unknown. “Our concern is with the chemicals that have replaced the ones that have been phased out. At least one of them is known to cause tumors in lab animals,” Andrews tells LIVESTRONG.COM about the new PFCs. Both Walker and Andrews told LIVESTRONG.COM that they aren’t trying to claim that one fast-food chain is worse than another. But we’ll let this handy-dandy chart speak for itself. Yup, we’re looking at you, Quiznos. So what can you do to protect yourself beyond simply choosing to avoid some of the places on the above list? Well, the EWG says exposure to these chemicals in food wrappers can be reduced by eating fresh foods, preparing meals at home and avoiding the use of paper tableware or eating microwave popcorn. You can also hit up EWG’s Guide to Avoiding PFCs. At the government level, Andrew shares that anti-PFC legislation is in the works in California. Besides that, the EWG has drafted a petition and is advising that the FDA further restrict the use of fluorinated chemicals in food or food-contact materials and should close the loophole that allows companies to self-certify chemicals as “Generally Recognized as Safe.” They have also sent out a letter to fast-food companies urging them to cease use of these chemicals. “We want to make it clear, as with all the contaminants we talk about, these are always just one more example of the chemicals that are around us everyday in our environments, from our drinking water to our food. And while we need to take action on specific chemicals, the broader, more important issue is taking action to reform the laws regarding chemicals in consumer products and chemicals in food,” Andrews told us. To check your food and see what chemicals are on EWG’s radar, the organization has put together a database of more than 80,000 individual food and consumer items you can search here. Because staying informed is always your best bet to making sure you’re staying safe and healthy. Have you heard of PFCs? Do you look out for chemicals in your food? Would this keep you from eating fast food? What are ways you stay informed about food safety?